1. Water serves as a catalyst for peeling. When a Toledo New Bath tub liner is installed, our patented system of quality adhesives will adhere the liner to the original tub for life. The liner is guaranteed for life not to leak. 2. The smallest gap between the drain flange and the beginning of the porcelain will start peeling. NOTE: It is impossible to mask the drain perfectly and consistently every time. Your new Toledo New Bath tub liner will be an exact copy of your current tub. The drain flanges will fit tightly on your new bath tub liner; approved plumbing sealants are used as if a new tub were installed in your bathroom. 3. 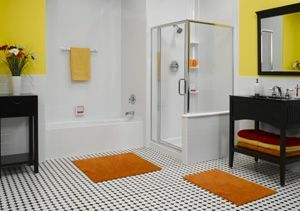 The drain is the most vulnerable part of the bathtub because of water activity. Toledo New Bath uses a wide variety of drain adapters to assure a tight and perfect fit. 4. Any object that falls in the tub, i.e., razors, shampoo bottles, hair brush, can cause chips or cracks in the epidermal or outside layer. Toledo New Bath tub liners are extremely impact resistant. As long as you use the approved cleaners, your liner is warranted for life. 5. If any residue is present after the etching process it will cause a break down in the chemical adhesion process thus start peeling. There is no etching of any kind when installing the Toledo New Bath tub liner. 6. Re-glazing is not intended to correct rust conditions that may exist in your bathtub nor will any re-glazing company warranty a bathtub with rust. Toledo New Bath's bathtub liners are an excellent solution to tubs with rust and holes rusted through the tub. 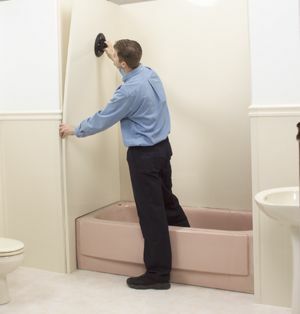 Toledo New Bath bathtub liners will never rust. Many re-glazing companies will even recommend our product be used to remedy these conditions. 7. When applying the paint, if the tub is not perfectly clean, bubbles or air pockets will form on the surface of the tub which will not allow the paint to adhere thus causing a breakdown and peeling. The Toledo New Bath's tub liner is a solid non-porous surface that guarantees durability and easy of cleaning. 8. Once a bathtub has been refinished it is necessary to remove the old surface before it can be successfully refinished again. This requires the use of toxic chemicals and adds considerably to the expense. When added together you could have had a beautiful liner that looks as good as the day it was installed, and we back it up with a lifetime manufacturer’s warranty. 9. When refinishing a bathtub, especially one in poor condition, a refinisher will have to apply fillers over the damaged tub to hide its condition and the result may not be acceptable. Toledo New Bath's tub liners are made in a factory using the highest manufacturing standards. Quality, consistency and expert installation are the standard for Toledo New Bath. 10. Refinishing requires special attention to its care and use. Few, and none known to us, will warranty chipping which frequently occurs. Toledo New Bath's tub liners are made out of impact resistant acrylic. Should an occasional scuff mark occur, it can be polished using a fine polishing compound commonly available at any automotive store or "Gel Gloss" which can be bought at our showroom or your local hardware store.